I'm waiting very patiently for the release of the space engine 0.97! I'm really anxious to try it out! Yeah, the most that has been found is an octuple star system and only two procedural octuple star systems have been documented. 5 and 6 star systems are rare, but they can be found sooner or later. I don't think there are any 7 star systems that have been found in procedural systems. I think the single star count is too high. If the OCR fails, it will count as a single star. It is kind of a let down when I regularly check the development status thread for any news on 0.97, see the little red flame icon and it turns out to either be drama or speculation on the release date with no actual news or release announcement. I did that too until i realized how time consuming it was. 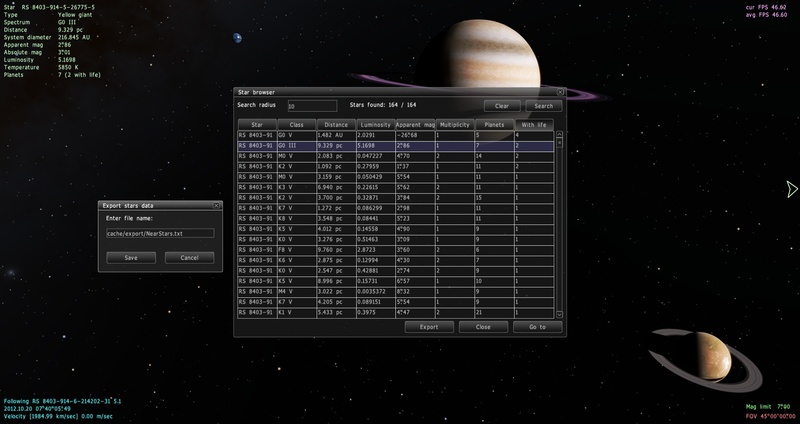 Then i figured out the Announcement Forum was http://en.spaceengine.org/forum/20-0-0-37 in terms of RSS. Now I linked my google reader account to this url. If you install Nextgen reader on Windows 8 for example, you will see any news on your Metro UI without a single move of your hands. Well, the fourms have come to a standstill... Time to do things in real life. Is there a function on this forum that allows me to see what posts you make? I like to follow things by seeing what specific users are posting rather than digging through discussion littered with questions about releases. if I could track your posts I'd likely pay attention. as it is, there is only this thread that I browse regularly because I really want to play with Auroras. Is there a function on this forum that allows me to see what posts you make? Not specifically as far as I know, but just look through the New Messages page whenever you get on so that you don't miss anything. Or if there's a specific thread you want to keep track of you can check it manually (and there seems to be a "Subscribe to the thread" button at the top too now). This is a "Star browser", it gets a list of stars in a certain radius from the camera (your current location). Some properties like distance, spectral class and luminosity are returned by engine immediately. But most interest properties - number of stars in a system, number of planets, and presence of life - are not available until planetary system is being generated. SE generates a systems relatively slowly - 0.1 - 1 seconds per system. So last 3 columns of the table are filled gradually, taking up to several minutes to be finished (depending on number of stars found, it is limited to 1024). Systems are generated one by one per frame, multithreading is not used, so FPS are dropped significantly, until search finishes. The table can be scrolled (of course), and can be sorted by any column, in ascending and descending order, by pressing keys above the table. 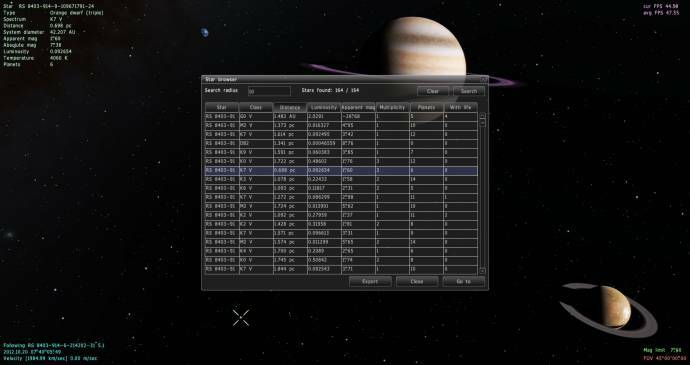 Clicking in the table selects the star, you may press the "Goto" button or "G" key to fly to it. Generated and sorted table can be saved in a text file by pressing "Export" button. This can be useful to build external databases and watch statistics - I will use it in future to tweak the procedural stars generator. Of course this is a very cheating feature. Now many forum's contests almost losts a sense, because you can easily found most habitable system or so. However, the searching (generating) time is big, and this is slightly softens the circumstances. But in the final game, you will not be able to determine the number of planets and life from the distance, you must enter the system on your spaceship, and explore it. Star browser will show a number of planets/life only systems that already was discovered by you or other players. Of course this is a very cheating feature. Now many forum's contests almost losts a sense, because you can easily found most habitable system or so. hmm, I know all space currently known space phenomenon will be implemented eventually, but I've got a question and kind of a request. How do the Auroras in 0.97 work? is it a looped animation or something a little bit more clever? I want to know if the aurora is a simple loop that I'll quickly learn to predict precisely how it will behave after a few hours observing it, or if it has something procedural going on which means each moment with the aurora is essentially unique? anyway, I know you will likely do this but I'd like it if you could inject some more life into Gas giants. I know with Saturn you have this essentially featureless disc which doesn't appear to have much interesting stuff going on in terms of motion. I don't know, I've never seen a time-lapse video of Saturn. and I'd love to see some variation in the appearance of gas giants. Not just their colour, but their texture. Some planets as distinctly banded as Jupiter with a kind of fluid turbulence animation going on in vaguely the near future would make me quite happy. Between Auroras and turbulent gas giant atmospheres It'd certainly help animate the universe a bit more. I'll make it clear, not asking if you'd do this, I understand that you plan to include as much as possible. I'm asking if you would please consider doing it soon. Well I know I'VE got a job to do once .97 and the browser come out: I need to 'fix' the text messages to the Kimb Style (as commented on and enjoyed by Frostbreath). I see three respellings begging to happen: Distanze, Lumbinozity, and Multiplizity. Too bad I couldn't get a 'Timeb' reference in there! PS: for those not aware of this running gag, kindly see posts #1135 and #1215 in thread "Image Dump"
Yay, finally we have this Celestia functionality in SE! I want to know if the aurora is a simple loop that I'll quickly learn to predict precisely how it will behave after a few hours observing it, or if it has something procedural going on which means each moment with the aurora is essentially unique? and I'd love to see some variation in the appearance of gas giants. Not just their colour, but their texture. I thought I was going to have an advantage and win all those contents with my database.... My current database contains 311,697 unique systems having a total of 3,192,211 planets. Should be many interesting systems in it (I still only have one octuple, but quite a few septuples now). Now many forum's contests almost losts a sense, because you can easily found most habitable system or so. I don't think so. There will always be things that are extremely hard to find. A star searcher will simply raise the bar. For instance, octuples are still extremely rare. Will anyone find an octuple with life? Etc. Now you've forced me to make another script, something that uses the star searcher, exports to an sqlite database, then moves and repeats. What I do sounds pretty silly. I don't have time to play (I have a wife, job and three kids, but I have a few minutes to write this, because it's Saturday and then the kids did of course got up at 05:50). So my natural programmer reflex is to make a program which will do what I don't have time for. So I write programs that play for me... I guess it proves that programming is more fun than games. This is a procedural animation, based on Perlin noise. You will not see repetitive pattern. Now you've forced me to make another script, something that uses the star searcher, exports to an sqlite database, then moves and repeats. This can be done with SE script system. I will implement commands that will allow to make automatic fligths through the galaxy and exporting the list of stars for each 100 light years for example. Text files then can be processed by external program. As long as systems being generated, it is possible to export all data (simply export the sxript of each system), but this will take a lot of disk space.